and then for making it worth having. with divine patience ---- and laughter. 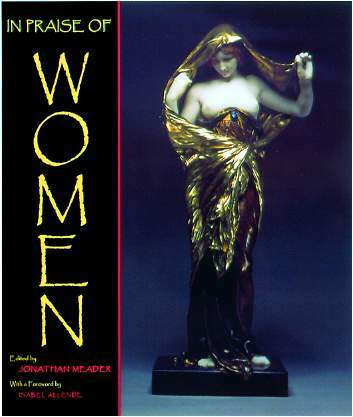 ﻿A book celebrating women with beautiful Sculptures, Images, Quotes, Histories and Myths ! I am the goddess of fertility and the idol of temptation, mother and whore. I am the womb where life begins and the breasts that nurture. I am the arms that embrace you in love and hold you in death. I am the eyes that see the soul and shed the tears of compassion. I am the hands that plow, and weave, and rock the child. I am the seer and the healer, but also the witch and the avenger. I am the virgin and the crone, desired and feared, sought and destroyed, always blamed. I am woman, mysterious and eternal. I turned the pages of this book with gratitude because it is not often that an homage like this comes from a man. In these confusing times, when women are redefining themselves and many men feel threatened by their unleashed power, this book comes as a rare gift from a man to all women and men. Jonathan Meader doesn't try to explain the feminine or decipher its contradictions: he simply stands in admiration of women. With great sensitivity, he has selected sculptures that transcend time and aesthetic rules, and matched them with poignant quotes and historical notes. Every image is an invitation to explore different aspects of an infinite subject. His own voice is nearly absent in these pages, and his discreet silence allows the beholder to dwell freely in the secret nature of each sculpture without judgment. As a woman I find this book deeply moving. Thank you, Jonathan, for your unique way of praising us. Having known Jonathan Meader for nearly thirty years, I have had the opportunity to watch In Praise of Women evolve since its conception. Jonathan started with a clear, pure vision, and has done a wonderful job infusing it with life. In Praise of Women is a work of art that will entertain and inform, while giving readers space to draw their own conclusions about the material. It presents women as creators and mothers, providers and protectors, seducers and lovers, dancers and goddesses, warriors and queens. They seem to rise from the pages, in all their strength and splendor, reminding us that gender equality is a necessity, a matter of mutual benefit, and that with it will come, in the words of Susan B. Anthony: "the ideal union between the sexes that shall result in the highest development of the race." Open this book and let yourself be seduced. 9 - Andrew Weil, M.D.